A diagnosis of Alzheimer’s disease flings every member of the family into a difficult and often chaotic situation. Caring for an Alzheimer’s patient is a full-time undertaking. As Alzheimer’s progresses, everyone; spouse, children and perhaps grandchildren may be asked to provide care. A diagnosis of Alzheimer’s is devastating. The disease appears gradually, gaining momentum as it progresses. 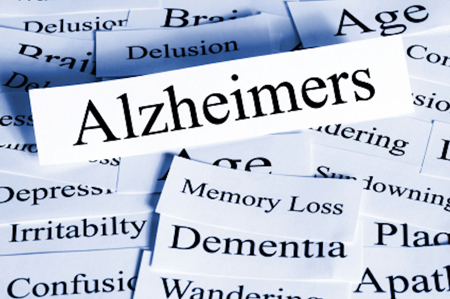 Alzheimer’s disease robs memory and destroys the ability to learn. Recalling methods of performing ordinary activities is difficult at the onset and spirals constantly downward as the disease progresses. There is currently no cure for Alzheimer’s. Flexibility, patience and compassion are the key strategies to caring for a person with Alzheimer’s disease. Establish and follow routines. Eat meals at the same times every day. Schedule bathroom breaks every two hours. Be creative in finding new solutions if a tactic stops working. Eating problems tend to appear in the early stages of Alzheimer’s. Your loved one may simply forget to eat. A simple reminder may be all that’s needed. The individual may not recall how to prepare food. Supplying ready-to-eat dishes will help. Some have an opposite symptom and want to eat all the time. Having consistent meal times will help control overeating. Limit the number of items served, but vary the consistency, color and taste of healthy foods. Another common symptom of Alzheimer’s disease is agitation and distraction. The patient may not be able to sit still long enough to eat. Turn off the radio or television, cell phones, and the land line phone ringer. Use plain bowls and plates. Clear the table of anything that might distract from eating, like decorations or extra table settings. As communication skills are lost, you will need to find new ways to connect with your loved one. Reasoning and judgment skills are in continuous decline. You will be more successful if you keep things simple. Use plain words and keep sentences short. Break tasks or requests down into steps. Use visual aids. Don’t try to hurry a response. It may take several minutes to process the information. When you are talking…..make eye contact and stay physically close. Help the patient understand that you are paying attention to what he is trying to tell you. Be respectful. Don’t argue. It will just frustrate and anger both of you. Sleep disturbances are common with Alzheimer’s and can wear down the caregiver and the patient. As with eating problems it is important to treat any underlying conditions. Many people have sleep apnea and Alzheimer’s patients are no exception. Try limiting daytime naps or make earlier wake-up calls. Take a walk around the block or the backyard. Be wary of caffeine in food and drink. Don’t overlook the health and wellbeing of the caregiver…..remember to take good care of yourself as well!